A team from DP Medical Systems is gearing up to attend a prestigious medical conference this week. Organised by the British Laryngological Association (BLA), Cutting Edge Laryngology provides a platform for the most up-to-date advances in understanding, diagnosing and managing laryngeal conditions, and how to use the very best of new knowledge and technology to get patients back to their work and lives. This leading conference continues the BLA previous celebrations of innovation in this field, and draws once again upon those who are really pushing the boundaries. There will be talks from inspiring leaders in fields including airway reconstruction and tissue engineering, revolutionary approaches to dysphagia and voice care, and a special session devoted to the most cutting-edge of speech and swallowing therapy. A team from DP Medical Systems travelled to Berlin recently, to showcase the firm’s portfolio of products and share expertise at the first ENT Masterclass Europe event. The event, hosted on 16-17 September 2016 at the Empress Friedrich House in the city, saw more than 150 high profile professionals attend for an informative programme of state-of-the-art lectures and panel discussions covering paediatric ENT, otology, rhinology/facial plastics and head and neck surgery. Owen Pemberton, commercial director at DP Medical Systems, said: “It was a pleasure to attend the ENT Masterclass Europe and to meet so many nationalities of ENT professionals in Berlin. 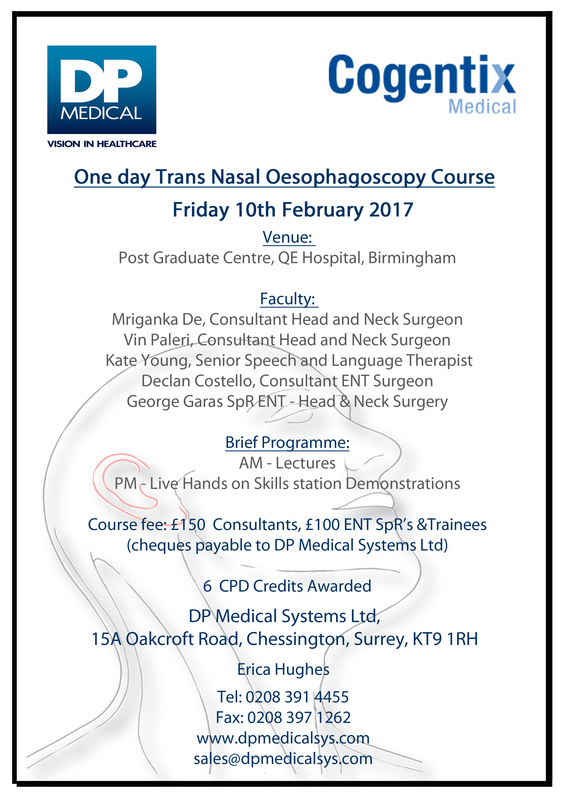 ENT Masterclass® is the largest free ENT training platform in Europe for senior ENT surgical trainees and consultants. More than 100 professors, consultants and other top opinion leaders from across the world are in the faculty. Calling all owners of Global microscopes! In our latest blog, Doug Pitman, managing director of DP Medical Systems, puts servicing under the microscope. “We have been selling the Global dental microscope for over 25 years now. During that time it has been adopted by hundreds of dentists as more and more of them realise the potential benefits this technology offers. It can be used across all areas of dentistry but in endodontics it is particularly essential to ensure accurate and predictable treatment. 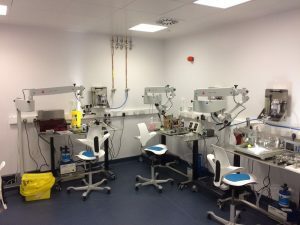 “The Global microscope is designed for many years of constant use and, here at DP Medical Systems, we have come across hundreds of microscopes which have been in service for almost 20 years. This longevity is assured by regular servicing from our factory trained engineers and helped by Global’s lifetime warranty against manufacturing defects. “As with any piece of equipment, performance to specification is vital for effective use. A robust care, maintenance and service programme covers all functions, testing and cleaning and ensures optimum performance whilst avoiding any unpredictable down time. “Global microscopes are fully upgradeable and a constant programme of R&D means new improved accessories and components are available. All units can be updated to the latest specification such as original light systems can be upgraded to the new high intensity LED lights which is of real benefit. *10% discount applies on all purchase orders & instructions received prior to 30th September 2016. This offer is only valid for new service contracts and customers who have purchased a Global Microscope from DP Medical. Kindle delight for Chester dentist! We are pleased to announce that we have a winner in our latest customer satisfaction survey competition. Paul Mottram, of the White House dental practice in Chester, sent us some feedback via our customer survey following a recent order he placed and was picked at random to win a Kindle Fire HD, worth approximately £129. Our very own Rahul Roy, area manager for the north and Scotland, was able to hand over the prize to Paul on a recent visit to the dental practice. 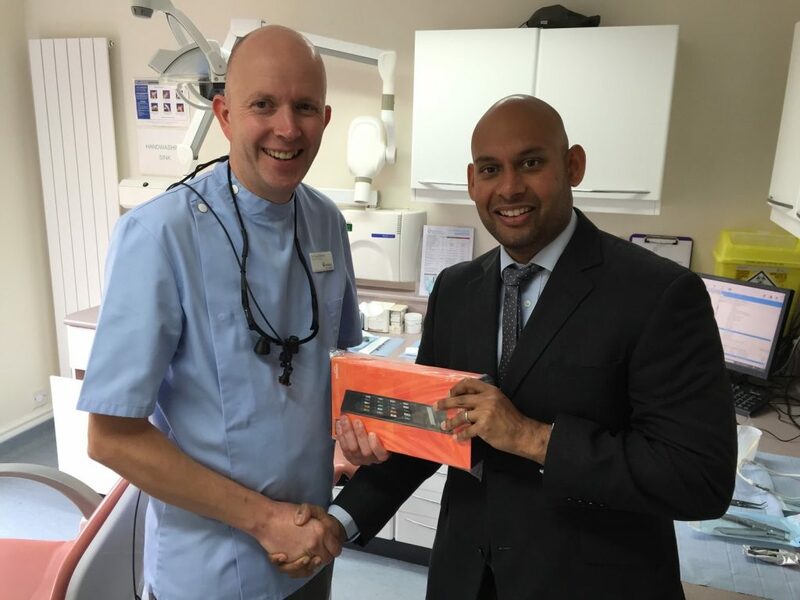 Says Rahul: “It’s always good to work with Paul and the team at the White House dental practice so I was thrilled to be able to present the Kindle to him in person. Leading medical supplies firm, DP Medical Systems, has today been unveiled as the exclusive UK distributor for one of the world’s most renowned manufacturers of complete endoscopy systems. The Surrey-based firm, which supplies and distributes healthcare equipment to the medical and dental professions, has been selected to distribute XION Medical’s full product range to the UK market. DP Medical will be working on behalf of Xion to showcase its range of innovative instruments and devices – including rigid and flexible endoscopes, navigation and camera systems, light sources, suction and irrigation pumps and insufflators. Owen Pemberton, commercial director at DP Medical, said: “To be named as the exclusive UK distributor for XION Medical is a huge honour for us here at DP. Michael Panschar, sales director at XION Medical, said: “We’re delighted to have joined forces with DP Medical Systems – one of the UK’s leading medical suppliers. To find out more about the XION range, click here. For further information about XION Medical, visit www.xion-medical.com. Cervical screening patients at a leading London NHS Trust will now benefit from an improved service thanks to innovative new scanning equipment. The new technology – MediScan – is a pioneering capture and archive system for gynaecological examinations which has been installed in the three Royal Free London NHS Foundation Trust Hospitals at Royal Free Hospital, Barnet Hospital and Chase Farm Hospital. MediScan provides clinicians with a secure pathway for recording, storing and encrypting patient gynaecology examinations for analysis and archiving. The still images and video are captured in real-time and stored against the patient record for retrieval anywhere in the hospital. The system – developed by DP Medical System Ltd – uses a simple to operate user interface, including touch screen technology and a question and answer based approach to data entry. Its digital still or video images are seen as benchmark quality by leading clinicians and have been used for illustration in medical texts. Owen Pemberton, commercial director at DP Medical Ltd, said: “We are delighted to see Medicscan fully up and running at the Royal Free London NHS Foundation Trust. 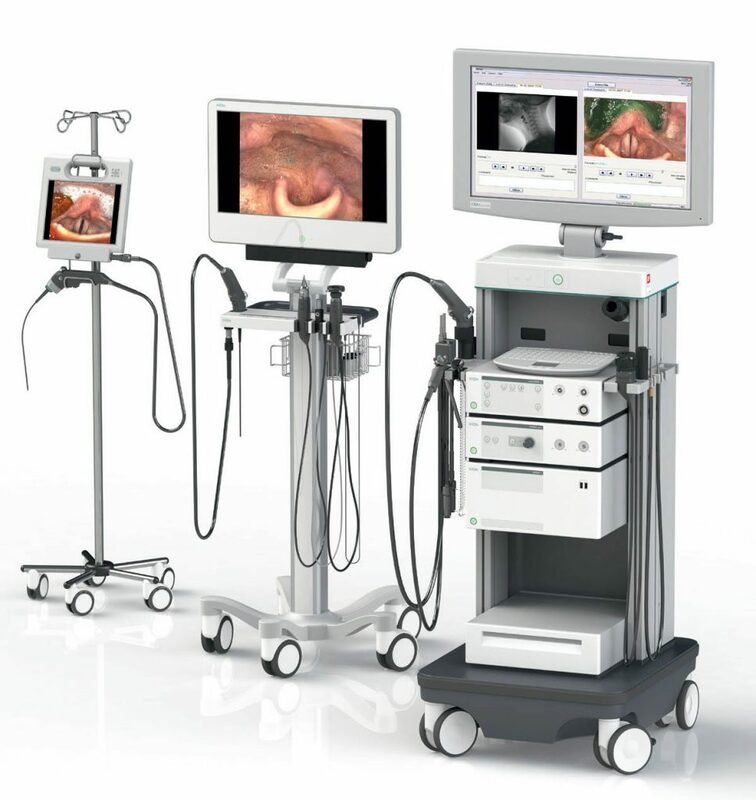 The system provides gynaecology clinicians with a number of key benefits, including increased software security, improved patient experience through image sharing and a better platform for end-users to educate students and other clinical staff on complex colposcopy cases. For further information about Mediscan visit www.dpmedicalsys.com/medical/gynae/mediscan/. “Giving back to the community is something that’s very important to us here at DP Medical Systems. “So, when I was asked by Alan McNulty – director of medical manufacturing firm, Sheffmed – to accompany him for two legs of a 1,200-mile bike ride to raise funds to train doctors and nurses in Africa, it was an opportunity I couldn’t turn down. “Alan’s cycling the length of the country, from Lands End to John O’Groats, over 10 days in July, visiting ENT departments along the way to raise awareness of the challenge and drive fundraising further. “I’ll be joining him for two days of the ride, from Taunton to Bristol on Tuesday 19 July, and from Sheffield to Harrogate on Friday 22 July. “Every penny we raise will go towards providing ENT clinical training for nurses and young doctors in Malawi, Africa, helping to form best practice for care in the country and build effective healthcare services there. “The cost of a months’ training is around £2,500 per person, and the team are hoping to raise enough to fund two nurses at a cost of £5,000. “This amount will enable both nurses to undergo the right education and training to allow them to perform ENT procedures. All donations will be match funded by Sheffmed.